The Ancient Forest Alliance’s campaigner and photographer TJ Watt by BC’s ninth widest bigleaf maple, the Woolly Giant, completely draped in hanging moss and ferns, in the Mossome Grove (short for “Mossy and Awesome” Grove) near Port Renfrew on Vancouver Island. Conservationists in British Columbia have recently located what may very well be the most magnificent and awe-inspiring old-growth forest in the country on Vancouver Island. The spectacular, largely unprotected grove, with several near record-size trees, highlights the need for new policies by the BC government to protect BC’s biggest trees, grandest groves, and old-growth forest ecosystems. The BC government has recently stated that they are currently developing a new set of policies to manage BC’s old-growth forests but have not revealed any details yet. The 13 hectare grove of immense old-growth Sitka spruce and bigleaf maples draped in hanging mosses and ferns, nicknamed the “Mossome Grove” (short for “Mossy and Awesome” Grove), was initially located in October and explored again in late December by conservationists Ken Wu of the Endangered Ecosystems Alliance and TJ Watt, Andrea Inness, and Rachel Ablack of the Ancient Forest Alliance. The grove is located on Crown land in the San Juan River Valley near Port Renfrew on southern Vancouver Island in the unceded territory of the Pacheedaht First Nation band. Most of the grove is unprotected, with a small portion, about four hectares, lying within an Old-Growth Management Area and in the riparian reserve along the San Juan River. The Mossome Grove stands on Crown lands in the operating area of BC Timber Sales, with a portion within a Woodlot Licence allocated to the Pacheedaht band and the rest under the regulatory authority of BC Timber Sales. BC Timber Sales is the notorious BC government logging agency which has come under fire across the province for auctioning off old-growth forests to be clearcut in such places as the Nahmint Valley and Schmidt Creek on Vancouver Island, as well as in Manning Provincial Park’s “donut hole”. 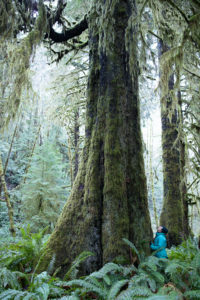 Several of the Mossome Grove’s largest trees are near record-sized, including a Sitka spruce that would rank the ninth widest in comparison to those currently listed on the BC Big Tree Registry (with a diameter of 3.1 meters or 10 feet & 1 inch) and a bigleaf maple that would rank the ninth widest on the registry (with a diameter of 2.29 meters or 7 feet & 6 inches). 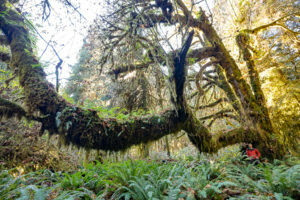 The massive maple, nicknamed the “Woolly Giant”, also may very well have the longest horizontal branch of any tree in British Columbia, measuring 23.1 meters (76 feet) long – more than the height of many second-growth trees – and is covered in thick mats of hanging mosses and ferns, resembling a prehistoric monster. The Ancient Forest Alliance’s campaigner Rachel Ablack by a huge Sitka spruce among then sword ferns in the Mossome Grove (short for “Mossy and Awesome” Grove) near Port Renfrew on Vancouver Island. Along with its “charismatic megaflora”, the Mossome Grove is also home to “charismatic megafauna”, including significant numbers of Roosevelt elk, black-tailed deer, black bears, wolves, and cougars, who inhabit the productive San Juan River Valley. Old-growth forests on Vancouver Island in the area are also important habitat for the marbled murrelet, northern goshawk, pygmy owl, screech owl, Vaux’s swift, and long-eared bats. 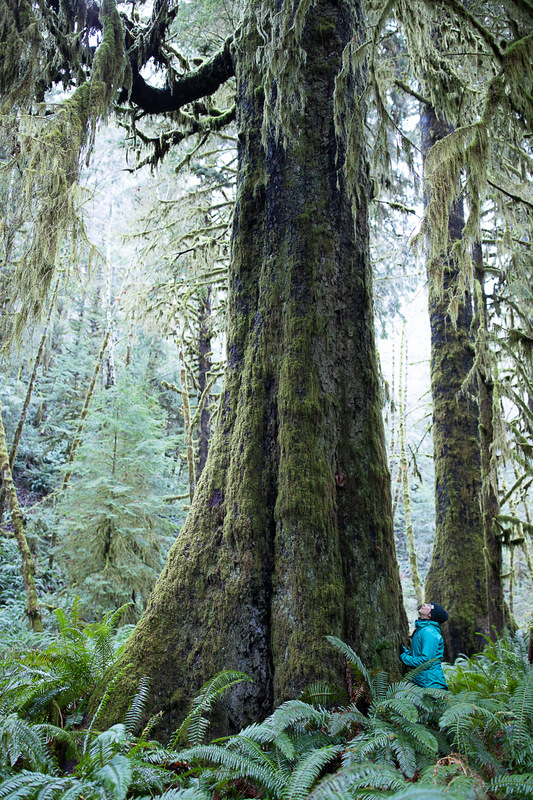 Old-growth Sitka spruce and bigleaf maple stands are best known in the Hoh, Queets, and Quinault Valleys in the Olympic National Park in Washington State, where millions of tourists visit to marvel at the mossy giants. In Canada, such ancient spruce/maple stands are essentially unknown by the conservation movement and tourism industry for the simple reason they are virtually non-existent here, except for this newly-identified stand and possibly a few small patches scattered around southwestern Vancouver Island. At the time of European colonization in BC, there would have been more extensive but still limited old-growth Sitka spruce and bigleaf maples stands in the San Juan, Nitinat, and Fraser Valleys. However, virtually all have been logged or converted to agriculture or urban sprawl (in the case of the Fraser Valley where Vancouver stands today). Due to its limited size, the scarcity of this forest type, and the fact that there are no trails, the Endangered Ecosystems Alliance and Ancient Forest Alliance are not publicly revealing the Mossome Grove’s location at this time until it can be safeguarded from excessive trampling, and most importantly, from future commercial logging. While an effective Big Tree Protection Order would be particularly important in cases like the Mossome Grove, more important would be science-based legislation to protect BC’s remaining old-growth forest ecosystems on a much more comprehensive scale. While new legislation and updated land use plans are being developed, moratoria on the most intact and highest conservation value old-growth forests like at the nearby Edinburgh Mountain and Upper Walbran Valley need to be implemented in places, while the BC government needs to also implement incentives and regulations for the development of a value-added, sustainable second-growth forest industry. Conservation financing support from the provincial and federal governments is also needed for BC’s First Nations communities to help foster sustainable businesses and jobs in the communities based on eco- and cultural tourism, clean energy development, non-timber forest products (e.g. wild mushroom and berry harvests), sustainable seafood harvesting, and value-added second-growth forestry. To ensure the protection of all ecosystem types, federal and provincial “Endangered Ecosystems Acts” are also needed to establish science-based protection and recovery targets for all ecosystems across Canada, including rare plant communities such as old-growth Sitka spruce and bigleaf maple groves like Mossome Grove. In the interim, the federal government has committed to protecting 17% of Canada’s land and freshwater ecosystems by 2020 and must greatly step up its prioritization and activity to achieve this target (currently Canada is at 10.6% protection). In particular, most of the provinces, including British Columbia, must still commit to meeting the 17% target, and conservation groups will be lobbying the province to adopt this target shortly. Old-growth forests are vital to sustaining unique endangered species, climate stability, tourism, clean water, wild salmon, and the cultures of many First Nations. On BC’s southern coast, satellite photos show that at least 75% of the original, productive old-growth forests have been logged, including well over 90% of the valley bottoms where the largest trees grow. Only about 8% of Vancouver Island’s original, productive old-growth forests are protected in parks and Old-Growth Management Areas. Old-growth forests, with trees up to 2,000 years old, are a non-renewable resource under BC’s system of forestry, where second-growth forests are re-logged every 50 to 100 years, never to become old-growth again. The Ancient Forest Alliance is calling on the BC government to implement a comprehensive, science-based plan to protect all of BC’s remaining endangered old-growth forests while also ensuring a sustainable, value-added, second-growth forest industry. Due to the popularity of nearby old-growth forests for large numbers of visitors from across the world, the former logging town of Port Renfrew has rebranded itself in recent years as the “Tall Trees Capital of Canada.” Not only is the town located near Mossome Grove, but is also near many of the province’s most popular ancient forest destinations including the Avatar Grove, Central Walbran Valley, Big Lonely Doug (Canada’s 2nd largest Douglas-fir), Red Creek Fir (the world’s largest Douglas-fir), Harris Creek Spruce (an enormous Sitka Spruce), San Juan Spruce (previously Canada’s largest spruce until the top broke off last year), Eden Grove, and Jurassic Grove. These ancient forests and trees attract hundreds of thousands of tourists from around the world, strengthening the economy of southern Vancouver Island. Environmental groups encourage visitors to stay in local accommodations, buy food and groceries in local stores, and camp in the Pacheedaht-run campground to help boost the local economy with eco-tourism dollars.